The purpose of the showroom is to have a place for you to come and get ideas about the projects you are planning. The purpose of the showroom is to have a place for you to come and get ideas about the projects you are planning. We have displays that you can see and touch and a dedicated staff to help you with design decisions, ideas, or concerns. Please check our Design Questionaire to help you get a jump-start on your ideas! 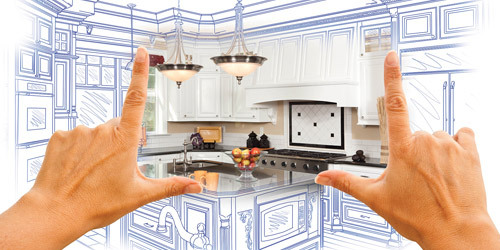 Of all the elements of a room remodel, the construction, door style, color, and material of your cabinets will make the strongest visual statement. Since cabinetry is such a large portion of the average kitchen or bath project budget, understanding all the options is critical. We can help. Questions you'll want to ask include: Will it work tomorrow like it works today? Does the manufacturer stand behind the product? When it comes to cabinetry there are many important factors to consider including manufacturer, quality of construction, door material, door style and finish, storage options and accessories, number of cabinets needed, and most importantly - what type of cabinetry you choose to buy. Howe Lumber can order your choice Kraftmaid, DuraSupreme, Brighton, or Crystal Cabinetry and address all your questions or concerns.